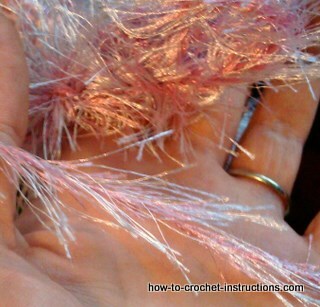 This classy crochet boa is so easy to make using only chain stitch and slip stitch. 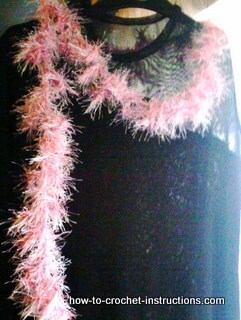 For a stylish finish to an evening outfit, this quick to make "feather" boa couldn't be simpler. You could easily make one last minute (or last hour really) before you go out. Choose a slinky feathery yarn that recommends the use of 5.5mm hook or knitting needle. I say it is easy, however this sort of yarn is both slippery and can tangle easily but it shouldn't take too long to get used to working with it and controlling it. I hope I haven't put you off because you will be delighted with the result. I designed and made the boa in the photograph on a 2 hour train journey, so it really is a quick and easy make. Repeat from * to ** until either you have finished the ball of yarn or your boa is the length you want it. 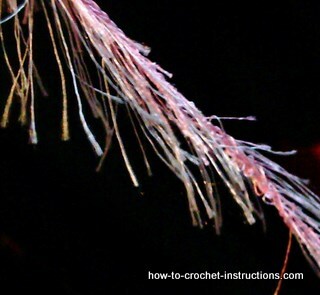 using a large blunt needle darn the ends in. ......... it couldn't be simpler. Make three boas and plait them together! These boas will make great gifts - no-one will know how quickly and easily you made them, and you don't need to tell them. They will think you are a genius and really care to have gone to so much trouble for them.